The Oregon Department of Justice won’t investigate a deal Gov. 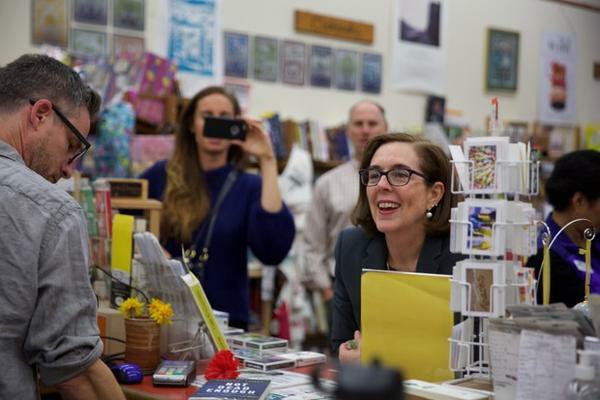 Kate Brown helped etch between union officials and a Nike employee over ballot initiatives, the agency said Wednesday. “Based on our review, we have concluded that a criminal investigation is not warranted in this matter,” reads a letter to Trout from Oregon DOJ Chief Counsel Michael Slauson. The complaint over the deal, authored by an anonymous party and filed by a Portland resident named Richard Leonetti, suggested Brown and others had engaged in foul play with a closed-door agreement. Under the agreement, first reported by OPB, labor unions agreed to drop a possible ballot measure that would have forced publicly traded companies to disclose tax information — a proposal Nike disliked. In return, Nike agreed to join unions in opposition to two other ballot measures: Measure 103, which would wall off groceries from some new taxes, and Measure 104, which would force the Legislature to meet a higher bar before it can raise revenue. Leonetti’s complaint noted that Julia Brim-Edwards, a senior Nike official who had a role in the deal, has created a new PAC called the Common Good Fund. It has been seeded with $100,000 from Nike. Leonetti said that amounted to an improper payment, alleging that the unions dropped their measure in exchange for a new pool of money to aid their opposition to the two other tax measures. State law prohibits accepting “any consideration” in exchange for hindering or delaying “any part of an initiative, referendum, or recall petition.” Neither Nike nor Brim-Edwards has said why the new PAC was created. It hasn’t reported spending any money. Debra Royal, chief of staff for Secretary of State Dennis Richardson, told OPB on Wednesday the office has not decided how to proceed.